You gotto love this picture`s brightnes and quality. Directly scanned from a 80 years old glass negative. The quality of those glass negatives is fantastic, just chemicals and a piece of glass, no digitals and still superb. Start number 5 is a wildcard attending a race held at Øya Stadum in Trondheim. 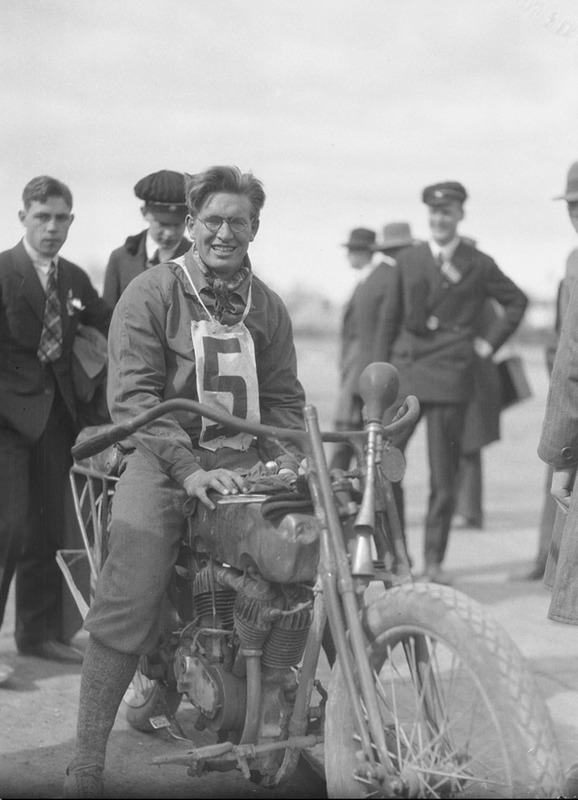 His 61" (1000cc) Harley is a roughly 1920 model where all parts not needed is removed to get rid of weight. Weight is the worst enemy of any daredevil looking for speed. This guy race in his cotton ski clothes, wearing whool knee socks and walking shoes. Cool. Wonder if he kept the ball horn in case he wanted to pass any of his competitors?